Dr. Murtaugh was deeply committed to graduate education and leaves behind his legacy with the students, scientists, and researchers he has influenced and taught over the years. Professor Michael Murtaugh, Ph.D., passed away on Tuesday, September 18 at age 67 from complications of pancreatic cancer. He was a member of the department faculty for over three decades, who was an internationally distinguished expert in swine virology and immunology, and a major contributor to graduate and post-graduate education in the College of Veterinary Medicine. On the day of his death, Mike was being recognized as the 2018 Allen D. Leman Swine Conference recipient of the Pijoan Lectureship for meritorious research on swine diseases; he enlisted a former graduate student, Dr. Michael Rahe, to present the lecture at this conference in his stead. Dr. Murtaugh earned a bachelor’s degree in biology at the University of Notre Dame and a Ph.D. in entomology at the Ohio State University, and conducted postdoctoral research at the University of Texas Medical School (Houston) in the Departments of Internal Medicine and Pharmacology. 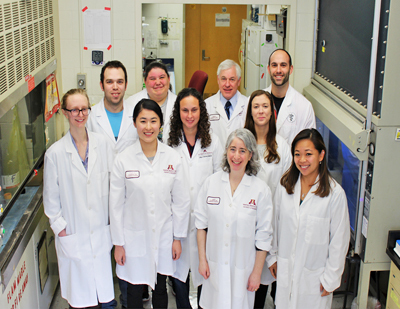 Mike joined the University of Minnesota’s College of Veterinary Medicine in 1985 and spent the entirety of his faculty career in the Department of Veterinary and Biomedical Sciences. He was a consummate scholar, excelling in teaching graduate courses, conducting research of the highest distinction – with a record of over 225 peer-reviewed journal articles – and making valuable contributions in service throughout the University. Prof. Murtaugh was an international leader in swine immunology and virology, and devoted considerable effort over the past quarter century battling the porcine reproductive and respiratory syndrome virus (PRRSv), a disease that costs U.S. swine producers alone some $500 million annually. Mike truly did consequential research. To many swine producers and veterinarians, Mike was the researcher who showed them what PRRSv was, how it was organized, what it could do at a molecular level, and how the pig responded to a PRRSv infection. He studied other viruses such as porcine circovirus and porcine epidemic diarrhea virus as well, which are also of economic significance to the swine industry. Mike’s critical thinking, rigorous scientific training and passion for science were attributes that he brought to research questions and instilled in others. Mike was deeply committed to graduate education. He was the primary advisor for 30 Master’s and Ph.D. students, and served as Director of Graduate Studies for the College’s Comparative and Molecular Biosciences program. Throughout his career, he was a dedicated and active participant in research seminars where students and other investigators presented their work. His questions to them were at once simple, profound and brilliant…the type of questions necessary to pose to students in order for them to progress in their scientific training. His lasting legacy is in the scientific training and education of a generation of graduate students, swine health specialists, and postdoctoral researchers. Mike possessed a dry sense of humor and a positive outlook on life, character traits that he maintained even during his struggle with cancer. He had a deep interest in the unmet potential for science to inform public policy and saw the need for individual scientists to be more actively involved in communicating their research to the public. His friends and colleagues at the University will fondly hold Professor Murtaugh in their memories for the impact he made on their lives, the department and College, and on the field of veterinary medicine. A graduate fellowship has been created in honor of Dr. Murtaugh. For those who wish to give online, the giving page has been set up through crowd fund. Donors can support his fellowship with checks made payable to the "U of MN Foundation" and mailed to Bill Venne, Director of Development & Alumni Relations, College of Veterinary Medicine, University of Minnesota, 1365 Gortner Avenue, Ste. 459, Saint Paul, MN 55108.